Thursday 8th September – Australian Market Wrap | Beeks Downunder-Because not all financial news is boring! ASX 200 collapsed under the weight of ex dividends, capital raisings and negative commodity leads. The index dropped through 5400, to close down 38 points at 5386. Few spots of green as all sectors suffer. Asian markets slid slightly, Japan down 0.32% and China down 0.07%. AUD steady at 76.92c and US futures up 13. Banks under pressure again with Commonwealth Bank (CBA) -0.69% and ANZ -1.10% falling the most. REITS showed some resilience after falls yesterday with Mirvac (MGR) +2.75%, Lendlease Group (LLC) +1.51% and Dexus Property (DXS) +2.13%. Private health insurers are back in the sellers’ sights with Medibank Private (MPL) -1.56% and NIB Holdings (NHF) -3.32% both suffering on churn and consumer switching out of health insurance. Resources struggled with iron ore and gold stocks particularly weaker. BHP -1.17%, RIO -0.29% and Fortescue Metals (FMG) -2.00%. Base metals were ugly with Independence Group (IGO) -6.05% and Oz Minerals (OZL) -3.66%. Energy stocks weaker with Whitehaven Coal (WHC) -1.42% reversing recent gains. Stanmore Coal (SMR) +3.09% bucked the trend though. Industrials hit today as ex dividends and a souring sentiment combined in a perfect storm. Chinese yuppie stocks (CUPPIES) fell hard, Blackmores (BKL) -5.34%, Bellamy’s (BAL) -4.13%, A2Milk (A2M) -3.69%, Murray Goulburn (MGC) -8.39% and Tassal Group (TGR) -3.42%. Others suffering with telcos down on broker downgrades to Telstra (TLS) -0.58% and Vocus Comms (VOC) -1.33%. Consumer stocks eased with Domino’s Pizza (DMP) -2.90% on fears that Pizza Hut would be back delivering some competition under new owner Allegro private equity. Aged care stocks resumed their falls as Macquarie joined the baying mob with savage downgrades to targets and earnings forecasts. Estia Health (EHE) -1.24%, Regis Healthcare (REG) -0.77% and Japara Healthcare (JHC) -2.58%. Speculative stock of the day: Kidman Resources (KDR) +20.83% following news of high grade assays from the Earl Grey major lithium discovery. First hole drilled returned 93m at 1.53% Li2O. Sigma Pharmaceutical (SIP) +11.26% said it expects full-year earnings growth of 10% after lifting its half-year net profit by 25.2% to $23.7m. Link Administration (LNK) -1.79% after private equity stock was placed with a range of institutions at a very bullish price of 838c. Around 104m shares were sold in the biggest block trade of the year by UBS. Australia and New Zealand Bank (ANZ) -1.10% after the chief operating officer Alistair Currie announced he will leave the bank later this year after a shake-up of the operations functions at the bank, which also announced its chief information officer will now report directly to the chief executive. Nextdc (NXT) +4.57% returned from capital raising with a whoosh after a $150m funding package to build another data centre in Sydney. A record high. 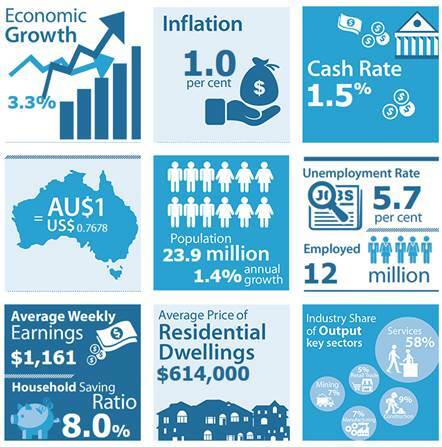 The RBA released its state of the economy snapshot. Trade data released today by the ABS. Official numbers from the ABS showed the monthly deficit shrinking 26% to $2.4bn, beating market expectations for a more modest improvement to a $2.7bn deficit. 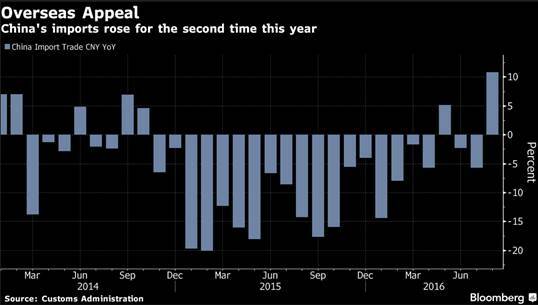 China’s imports rose in August for the first time in nearly two years, up 1.5% while exports fell 2.8% from a year earlier suggesting domestic demand is picking up along with firmer commodities prices.That resulted in a narrower trade surplus of $US52.05bn in August, versus a $US58bn forecast and July’s $US52.31 billion. Retail sales of cars, sport utility and multipurpose vehicles increased 24.5% to 1.8m units in August, the China Passenger Car Association said. Buyers are anticipating the expiration of a tax cut on purchases of vehicles with smaller engines. Deliveries for GM increased 18% in August, while Nissan rose 17%. Ford sales climbed 22%. Crude imports rise to 7.77 million b/d, highest since April. Coal imports surge as domestic mining slows, prices increase. Markets cautious ahead of Super Mario. Apple launches iPhone 7 and a new watch. Ditches headphones and cops immediate barrage of discontent. US firm Liberty Media has confirmed it is buying the Formula 1 business for US$4.4bn. Bernie Ecclestone will remain chief executive but Chase Carey will become chairman. Micro Focus and HP Enterprise in US$9bn tie up. Super Mario is front and centre today as the ECB meets to discuss how to shuffle the deck chairs. Meanwhile in the UK Bank of England chief Mark Carney is ‘absolutely serene’ about the Bank’s preparations for the impact of Brexit. Glad about that. For months, archaeologists had been tolling deep in the Amazon jungle, clearing creepers and rampant, choking undergrowth from the faint traces of a Lost City. Their excitement mounted as the place’s extraordinary purpose became evident. Broad, winding avenues of giant flagstones had deep, narrow, perfectly circular holes every few hundred yards. It had to be a golf course! Any doubt was dispelled by the discovery of stone panels depicting human figures using primitive prototypes of irons or putters. The next step was to interrogate local native tribesmen about traditions associated with the prehistoric golf club. The tribes did have legends of Old Ones who followed a daily ritual with the clubs and balls, until routed by tragedy. The interpreter nodded eagerly and relayed the query. The elder, surprised, made a sweeping gesture at the jungle, and replied tersely.